You have grown a successful business, managing recurring revenue for numerous clients in your chosen field. You own an excellent front-end product, which is loved by your customers. You have built an efficient collections team and you have organized a sophisticated infrastructure to handle flows of funds, management of fees and execution of remittances. You want to expand, grow further and enter new markets, but the weight of the existing process is slowing you down. Your backend system is old, difficult to maintain and not suited for non-aggregating processing models. Your transaction volumes are high and you can only afford ultra high performance solutions. Your remittance and reconciliation processes need a labor optimizing upgrade. You are ready to take the risk, but your current load is too heavy and stakes are too high. UniPay might be what you are looking for. Multi-processor support can help you win customers with existing merchant accounts, as well as support both aggregating and non-aggregating processing models. Flexible integration API will help your flagship front-end product speak with the new backend system in no time. Fully automated processing, remittance and fee assessment processing will eliminate unnecessary manual labor, while your collections team could take advantage of our automated debt recovery functionality. We, as a team, will help you tune the system to accommodate perfectly your existing business model. Together, we will work out a migration plan and gradually shift your customers from the existing system to UniPay without any service interruption. 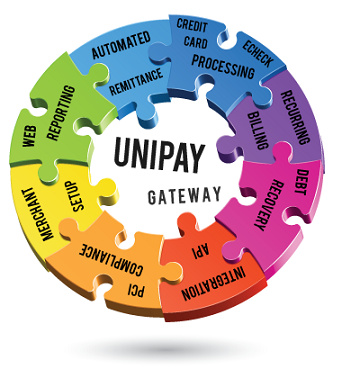 Contact us to discuss your options as UniPay based Billing Service Provider. Find out what payment processing solution will meet the requirements of the modern billing company.